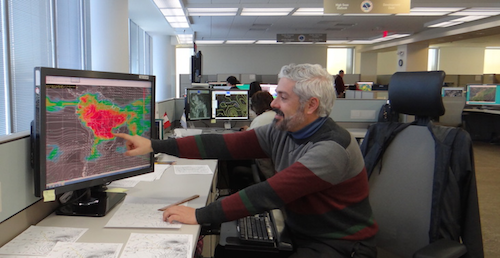 At his desk, Jose Galvez looks at a weather map of South America. 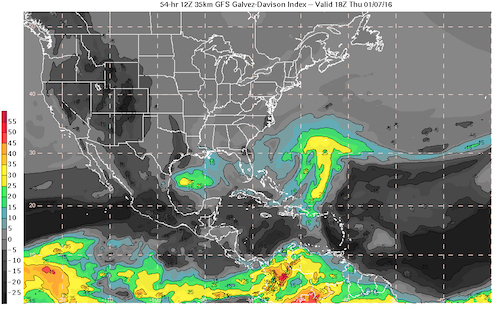 Years later, Galvez now works in the Weather Prediction Center International Desks at the National Weather Service (NWS), which is part of the National Oceanic and Atmospheric Association (NOAA). He’s the assistant to the coordinator and one of two NOAA instructors on operational weather forecasting for Latin America. He also researches new ways to forecast the weather. 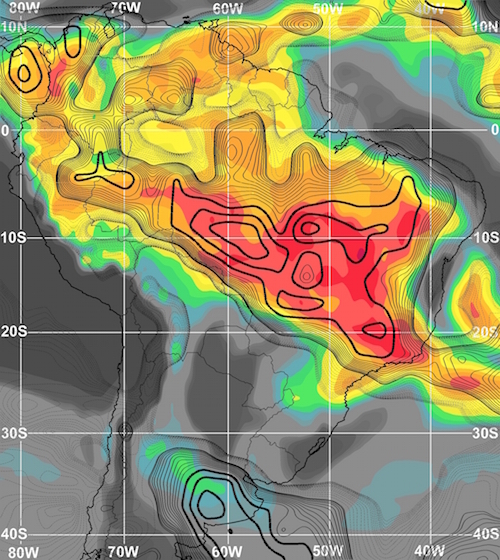 For example, he worked on a stability index that looks at convection (the movement of heat and moisture) in the tropics and subtropics. No two days are quite the same when you’re predicting something as complicated as the weather. Galvez splits his time between instructing students, forecasting weather, and researching weather-related topics. Some days he’s working with students to forecast weather and rainfall in South America, Central America, and the Caribbean. He trains them on the ins and outs of weather forecasting, as well as the tools the professionals use. “We follow a weather analysis and forecasting routine that uses observations and numerical model data,” Galvez explained. It’s like a big puzzle, in a way. Galvez and his team need to interpret lots of different data from lots of different sources and use it to develop the forecasts people need. “Other times I concentrate on research where I look into different weather-related topics,” said Galvez. This picture, like the previous one, shows information from the Galvez-Davison Index. 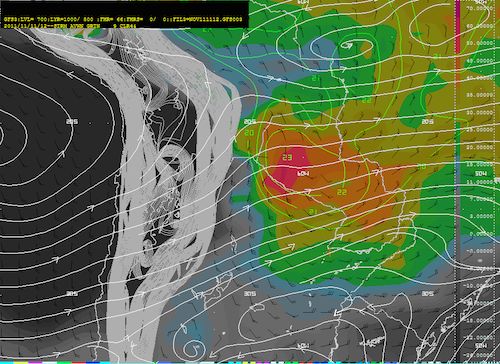 It shows areas with atmospheric instability that can lead to thunderstorms. Image courtesy of Jose Galvez. Galvez does research for the NWS and NOAA because he has a background in how to do research. He has a Ph.D. in Meteorology from the University of Oklahoma. A Ph.D. is also called a doctor of philosophy, doctorate or doctoral degree. It’s the highest level of education a person can achieve, and it takes a lot of time and work. To get a Ph.D. a student first needs a bachelor’s degree (and sometimes a master’s degree) in a subject, such as meteorology like Galvez. Then they choose to go to graduate school and work with a professor. They spend years taking classes and doing research. That means you’re not only learning; you’re discovering new things. When Galvez isn’t looking at storm clouds in South America or thinking of new ways to predict the weather, he enjoys running, cooking, and gardening. He’s also an avid traveler who loves exploring the world—and its weather! 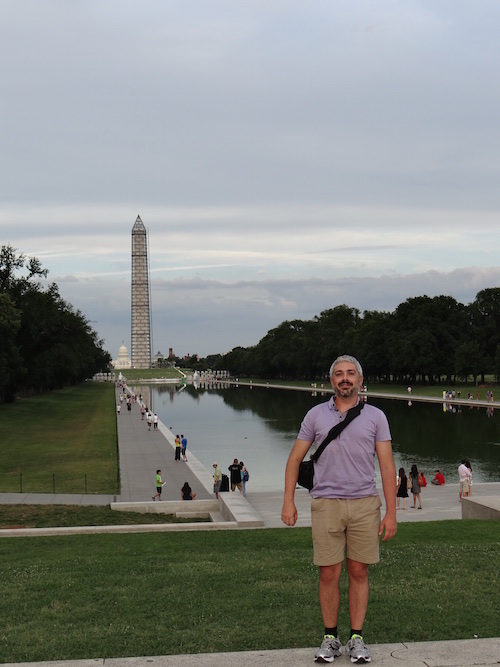 Jose Galvez visiting the Washington Monument and observing the weather in Washington, D.C. GOES stands for Geostationary Operational Environmental Satellite. GOES stands for Geostationary Operational Environmental Satellite. The first GOES weather satellite was launched in 1974. In 2016, the first satellite in the next generation of GOES satellites, the R-series, was launched into orbit. These new satellites will be able to map lightning in real time, improve weather forecasts, and monitor the sun's activity. Learn why satellites have different orbits. Read about how weather satellites save lives.